business, but if you get exhausted, there is perfect Garden for relaxation. 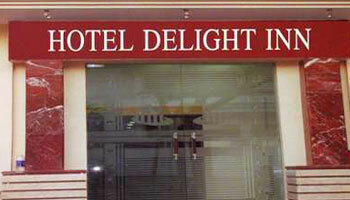 Though Hotel Delight Inn has redefined the paradigm of luxury and services, it still continues its efforts to enhance the level of efficiency in its entirety. The commitments towards excellence and attention to detail have invited accolades form all domestic and inbound guests. The blend of contemporary comfort, traditional hospitality and miles of privacy makes the hotel an excellent destination for the city visitor. Beyond this, a variety of accommodation options like Executive room, Suite room, hotel services are available with all prerequisite facilities and amenities to ensure the feel of home, away from home. The hotel features elegantly decorated suites and rooms, which have tastefully decorated interiors, encompassing all the modern trends. Apart from spacious accommodations, you will receive unparalleled service by our courteous staff round the clock. In all efforts, every staff at the hotel brings forth the best; to provide you lifetime memories to cherish. Breakfast Services, Room Service, Currency Exchange, Laundry Facilities, Security Guard, Travel Counter, Airport Transportation, Backup Generator, Doctor on Call, Parking. Air Conditioning Room, H/C Water, House Keeping, Toothbrush/Razor on Request, DVD Player, Iron/Ironing Board, Cable/Satellite TV, Attached Bathroom, Wakeup Calls.